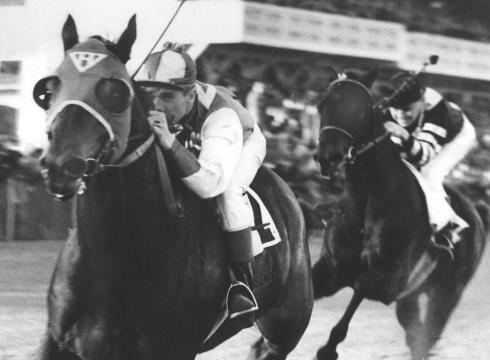 Join us as we pay tribute to the champions of the past, present and future at this year’s flashback-themed Florida Thoroughbred Breeders’ and Owners’ Association Awards Gala! This year, the event is coming back t o Ocala’s Circle Square Cultural Center ballroom on Monday, March 14th at 5:30 p.m. Cocktail attire is recommended (that means no jeans, sorry!). The cocktail party will start at 5:30 followed by the Florida Thoroughbred Charities silent auction, which will include memorabilia from the racetrack collections of Calder Race Course, Tampa Bay Downs, and Gulfstream Park. A lavish dinner will follow with an exciting live auction of packages including World Series tickets, a Play & Stay overnight package for four from Adena Golf & Country Club, a fishing trip for four in the Keys, and other enviable items. The night will culminate with the awards ceremony in which we honor Florida’s champions, both human and equine. Don’t miss this exciting night and wonderful opportunity to give back to our community. Click here to enter to win free tickets! Florida Thoroughbred Charities is the philanthropic arm of the Florida thoroughbred industry. Since 1990, FTC has strengthened and supported the community by raising more than $3.5 million for charitable organizations within the thoroughbred industry, the city of Ocala, Marion County, and the state of Florida. The charity also funds the Second Chances thoroughbred retirement farm at the Lowell Correctional Institution, which gives women there a chance to learn equine skills that will empower them to gain employment on local farms after their release. In 2015, the farm celebrated its 15th year anniversary to great success producing almost 0% relapse rate of participants—even in retirement, these horses continue to bring joy and change lives. The most recent retiree to the farm is Florida-bred stakes winner East Hall, winner of over $700,000. Tickets are $100 for members and $125 for non-members. Members can extend their discount for up to three guests. Early RSVP is recommended by March 7th. For more info go to ftboa.com, contact the FTBOA at 352-629-2160, or check out the invite below.